The common area in AMLI Miramar Park rental community aspire to be more than just the transitional space between one’s apartment and one’s car. Landscape Design Workshop set up to create an outdoor environment that provides a quality of life typically associated with home ownership. The common area is located in the open space nestled between the surrounding buildings. It is comprise of a series of distinct spaces that are interconnect and seamlessly flow into each other. The garden spaces are more intimate and provide an opportunity for quiet contemplation whereas the clubhouse and the pool area offer the opportunity to socialize. 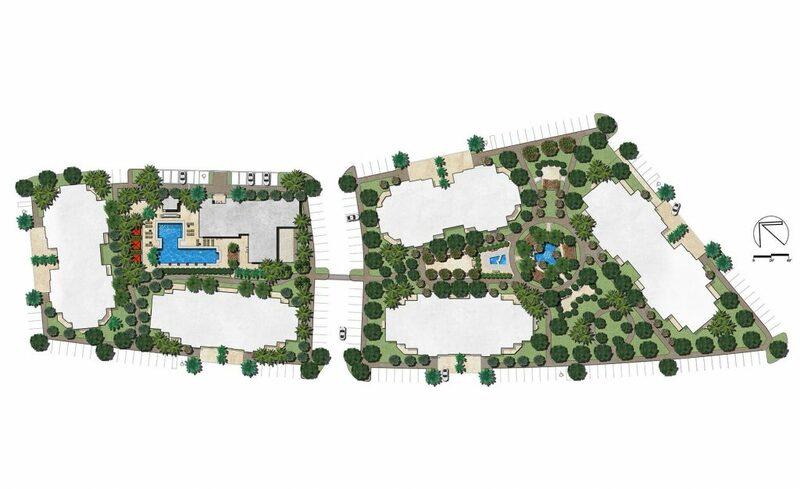 Provided landscape architecture and planning services for the entire project including site planning, planting, hardscape, lighting & irrigation. The clubhouse amenity area includes a contemporary swimming pool with a wall fountain, pool house, cabanas & summer kitchens. The Village Green is composed of a series of inter-connected themed gardens including a native garden, formal garden, sculpture garden & Koi-pond garden.